Today we worked on our Cookie Island projects. We used different food items to create landforms on a large sugar cookie. We used green coconut for plains, Hershey Kisses for mountains, brown frosting for dirt, chocolate chips for hills, miniature candy bars for plateaus, blue icing for rivers, and then we placed them on a blue napkin which became our lakes and oceans. We created our islands in the morning, then in the afternoon, we had to draw it out and color it on a map. When we were all done, we got to eat our cookies. Next week we are going to use the app, Skitch, to label a picture of our Cookie Island. Watch for a post showing our Skitch’s. A HUGE thank you to everyone who sent in food items and to Mrs. Young who helped us out in the hallway. THANKS!!!!!! This week we are working on Unit 15 in Spelling. Today your child should have brought home their pretest and homework paper. This week’s skill is working with homophones. Homophones are words that sound the same, but are spelled different and have different meanings. I found a homophone matching game to help you practice this week’s skill. If you would like to play, just click on the picture below. January 21, 2013: Happy MLK Day!! 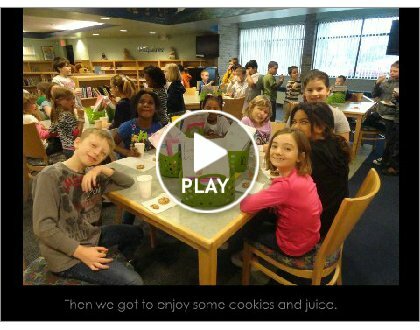 I found this wonderful video on Mrs. Descamp’s blog. Take a look!! NO SCHOOL: There will be no school on Monday, January 21st. Enjoy your day off!! GYM/LIBRARY: We have Gym class on Tuesday, don’t forget to wear/bring your shoes. We have library on Friday, don’t forget to bring back your books. WATER TEST: We will be taking our test on The Earth’s Land and Water on Tuesday. Please help your child study for the test by going and studying the review sheet. BOOK TREASURE BOOK: Don’t forget that retelling sheets and envelopes are due back to school by Tuesday. COOKIE ISLAND: We wll be making our “Cookie Islands” on Friday. If you signed up to send something in, please send it in by Friday. This week we read a book called, Snowmen at Night, for our book treasure book. After we read it, we made a picture with torn paper and chalk showing what we thought our snowman does at night. Next Friday, we will be video-conferencing with a school in New York to share our pictures. On Friday, your child should have brought home their envelope, retelling sheet, and a little snowman cutout. Retelling sheets and envelopes are due back to school by Tuesday. If you would like to listen to the story again, just click on the video below. Congratulations to the following students for participating in the Pizza Hut Book It program. They read 25 books in December and earned a free pizza from Pizza Hut. January 19, 2013: Way to Go!! Congratulations to the following students who completed the December homework calendar. They received a certificate, five eagle bucks, and a grab from our candy jar. Way to go guys!!! Today we had an aweome assembly put on by The Blue Pigs. The Blue Pigs are Detroit police officers who are in a band. They sing songs that have a positive message about staying drug free and leading a healthy lifestyle.